What is Spotify Connect and How Does it Work? The Spotify streaming service provides access to a lot of great music but as you go about your day you don't always want to continue listening on the same device. When you get home from work or wandering around town, it would be great to put down your smartphone and listen to the rest of your favorite song on your PC, home audio system, or even your TV. With Spotify Connect, you can do just that. Spotify is synced to the Spotify Cloud Server. This means that when you listen to music via streaming, it is sent from the cloud unless you are using off-line mode. The Spotify Connect feature allows you to transfer music from one compatible listening device to another. Not only will a song continue to play on the designated device without interruption, but more music will play until you decide to stop. All your Spotify-compatible devices need to be on the same Wi-Fi network. Make sure the Spotify app is up-to-date on all your devices. Open Spotify on your iOS or Android smartphone or tablet and start playing a song. Your smartphone will return to the play screen and display the new device name at the bottom of the screen. Open Spotify on your PC or Laptop and start playing music. Click Connect to a Device on the bottom-right of the Spotify screen. A green bar will be displayed at the bottom of the screen with the words: Listening on (name of the device). Open Spotify on your device via a compatible web browser (Chrome, Firefox, Edge, Opera) and start playing music. Choose a device from the list. A green bar will be displayed at the bottom of the screen with the words: You're Listening on (name of the device). If you're listening to Spotify on your smartphone, and you want to transfer music to your PC, make sure the PC is on and the Spotify App has been opened. If you have a Premium Account, Spotify Connect will allow you to transfer local or Spotify music from your PC/Laptop to your smartphone. The smartphone will be listed as one of your available devices. Initially, Spotify Connect only worked with the Premium subscription plan (you might still see references to that effect). 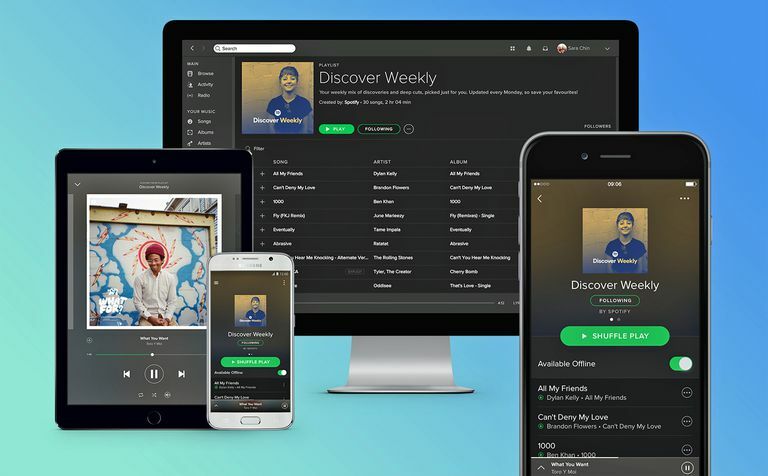 However, it now works with the free plan, with a catch – Not all Spotify Connect compatible devices work with the Free Service option. The following includes links to lists of devices compatible with Spotify Connect. Some are compatible with Free and Premium accounts (such as Google devices), while others will only work with Premium-only accounts (such as Alexa devices). Devices with Free Account compatibility are highlighted within the lists. Smart Speakers – Including Google Home, Amazon Echo, Harman Kardon Invoke, and Sonos One. Home Theater Receivers and HiFi components – Select models Anthem, Denon, Marantz, Onkyo, and Sony. Smart TVs – Select models from LG, Samsung, and Sony. Roku removed Spotify as an offering in December of 2017 but has added it back in beginning with its OS 8.2 and 9 updates beginning in November 2018. If your Roku device has received the update, it will support Spotify Connect via both the Spotify Free and Premium services. Game Consoles – Nvidia Shield, Xbox One, and Sony PlayStation 4. Check out a running list of more possibilities. Spotify Connect makes listening to music more convenient. As you move from location to location within the same network (such as your house or office), you can transfer music from one device to another without losing a beat. Here are some additional benefits of Spotify Connect. You can make and receive phone calls without stopping the music. Once you select a device, you can turn off your smartphone or PC/Laptop and the music will still play on the designated device. Although Spotify Connect only allows streaming music playback transfer to one device at a time, you can use it with a multi-room audio system, such as Sonos. Once you send music from Spotify to a Sonos speaker, you can then play the Spotify feed on other Sonos speakers you might have at the same time. Spotify Premium subscription required. If you have a Premium account and are listening in off-line mode (you have downloaded your music), you can also use Spotify to play music on more than one device at a time. Although you can use Spotify with Bluetooth, instead of Spotify Connect, its quality is not as good. If you have an iPhone or iPad, in addition to Spotify Connect, you can use Spotify with Airplay if you prefer. With Bluetooth and Airplay, your phone needs to stay on when playing music from Spotify. The reason is that the music is streamed directly from the phone to your device rather than streaming from the Cloud. What Is Plex And How Does It Work? What Is Waze and How Does It Work?